Satco LED high lumen A25 light bulbs with 35 watt mogul base are a daylight white 5000K color that replaces up to a 350 watt incandescent providing the light you need with extremely long life. These are the non-dimmable version. You probably won't have to change these bulbs for many years while still providing excellent illumination. This can be used in standard interior light fixtures in a home, but also for commercial lighting applications like outdoor lanterns and globes too. For those of you who want the maximum light output that you can get from a screw in type of light bulb, this would be a good choice for you. 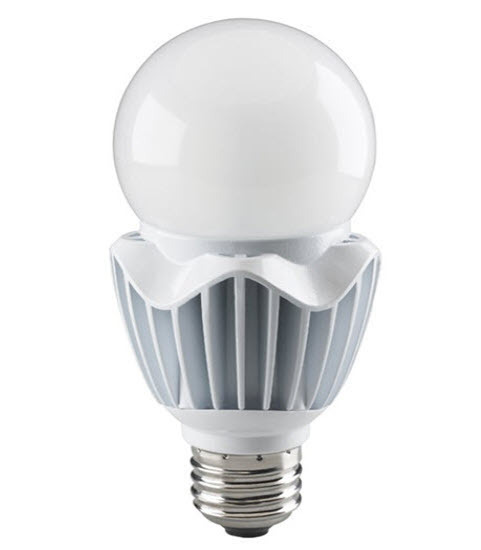 Even though it's the size of a regular light bulb, it's going to give you a replacement up to a 350 W incandescent. And if you're a person who needs more light for vision, and that's a lot of people who are elderly, this would help you see better. This particular one has a color temperature of 2700K which is like warm white incandescent lighting. And frankly there aren't that many out in the marketplace at this color temperature which a lot of people like for their living rooms and general areas in their home. People still like the color of incandescent lighting because it does very well with earth tones and gives the home a more inviting appearance. And that's not to say that this isn't popular also in commercial lighting, it still is. Even commercial buildings like that atmosphere where the light seems warmer and more inviting. A lot of people don't like the coldness of some of the higher color temperatures and that's why they choose this. In any case, you're going to get excellent energy savings and probably some of the best light output that you can get in a standard type of LED light bulb. - 5000K daylight white color.